Prance in poetic prettiness! 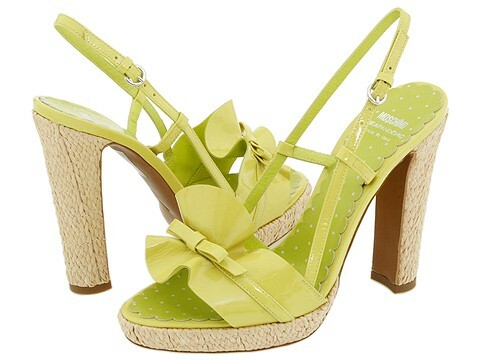 Blossom like an exotic flower enhanced by the presence of these pleasing platform sandals by Moschino™! Ruffled vamp surrounded by a slender bow. Side buckle closure. Precious polka dotted leather lining with a scalloped edge. Leather sole. Wonderfully weaved detailing around the outer sole and heel. The 3/4 platform makes the 4 1/2 heel feel like 3 3/4. Made in Italy. 4.50 heel. 8.00 oz.